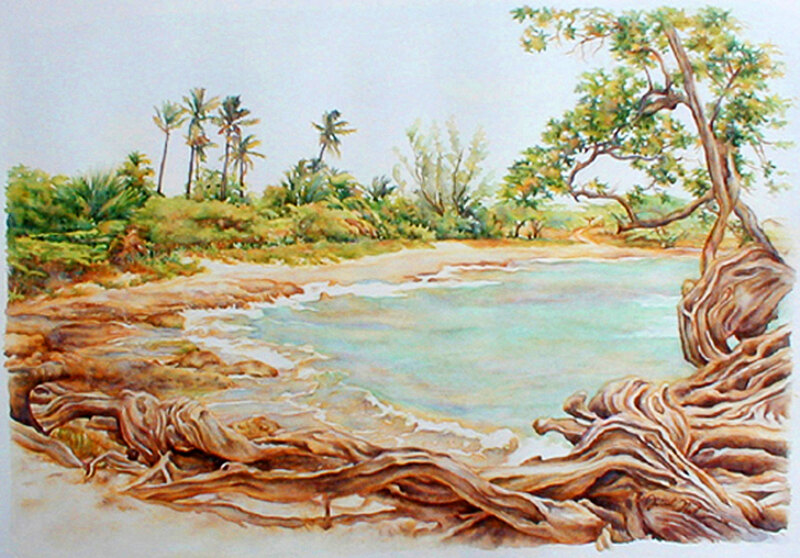 Anyone who has been to Treasure Beach in the parish of St. Elisabeth, Jamaica has seen this famous tree and standing right beside the roots of this tree looking westerly towards the shoreline, I could see the beautiful rhythm and a harmonious weaving that was created by the roots of the tree themselves. I was so inspired to capture the patterns and shapes created by the wood and the sand, especially with the rolling waves in the background. Hence the title, “Treasure Roots”. This is a limited edition of 250 giclée prints on watercolor paper. The original painting has been sold.